The Privacy Checkup helps you review who can see your posts and info from your profile, like your phone number and email address. It also shows you your settings for apps you’ve logged into with Facebook. 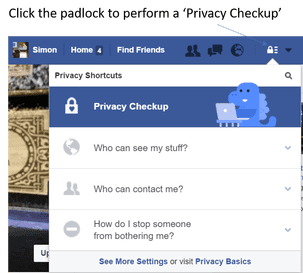 You can use the Privacy Checkup to review and adjust your privacy settings to help make sure that you’re sharing with who you want. If you don't want any of your students or colleagues following you on twitter, instead of uploading a picture of yourself, upload an image of a family pet. 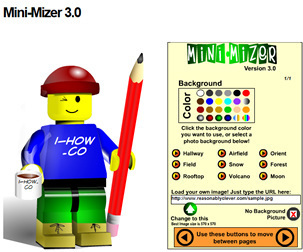 If you want to be really creative, you could create a caricature of yourself using a variety of fun online tools (see examples below) - Just remember not to make it too life like! Make sure that you do not identify where you work in your bio description, instead list your hobbies and interests (This can be useful when creating networks for your teaching subject). A problem with locking down your profile is that, although it protects you, it also makes it difficult to connect with other educators and take part in discussions. One way around this problem is to consider creating separate Facebook accounts, one for the classroom and one for personal use. You can even customise the background for each account so as not to get them mixed up. It always concerns me when I see pictures posted by teachers of their students on Facebook. Being a teacher myself, I can know the immense pride we have in our students and can understand why teachers would want to share this with the world however, being a teacher, I'm also aware of safeguarding issues - particularly with regard to photo permissions. Even if I know that all my students have photo permissions, I will never post images of my students - instead I leave this for the school to post on the official school blog and/or official school facebook account. I'm not saying this is wrong however, not being a legal expert, I would rather err on the side of caution! Also, even if a student has photo permissions, can you guarantee that a parent would be happy with you posting an image of their son / daughter, for the world to see, on Facebook? I'd rather not take that risk! Sounds obvious but we've all had bad days and we all know how good it feels to get get things of our chest however, as a professional, Facebook is not the place for this! It's also not the place to post your antics from the weekend either! Keep it professional and, ABOVE ALL, keep it clean! On their own, the above recommendations aren't going to guarantee that the user you wish to connect with is genuine, but when combined, and with a little digging, can help you decide whether or not it's safe to make a connection. ​What else can you do to protect yourself when using Facebook? Report abuse - Learn how to report something that goes against the Facebook community guidelines. Your privacy - Learn how privacy settings help you connect and share with people you trust. Keeping your account secure - Learn how to se Facebook's security features to add extra layers of protection to your account. Removing tags - How to remove a tag from a photo or post.